Response-ability is all about your ability to intuitively anticipate the future and to know what your customer wants before your customer knows it. Intuitive anticipation is the main differentiator for successful, innovative companies. How do you create a looping process in the organization? You start with where you are, then you go out and look at what the customer is doing. You find out what the customer needs and wants. You investigate their pains, and gains and jobs to be done. Pain: Quite literally a pain is something that’s hurting your customer, that’s keeping them awake at night, at that point in your journey. What do you want to get rid of. Gain: Their gain is an ambition, a dream, what they want to get out of it at that stage of the customer journey. Job: What job are they trying to get done at each point in the journey? People don’t want drill bits, they want holes. Imagine a traditional farmer, interested in technology who has problems with sustainability, succession planning, implementing robotics and automation in the farm. They want to buy a new machine. What are their pains right now? Most farmers don’t want to spend money, if it were up to them, they would buy a tractor that doesn’t rust and works for 20 years. Today’s farms are very different than their father’s farms, they have to create a sustainability within changing regulations. They have to maximize crops on fields that they used to leave fallow during the winter, so they want to work seasonally. What do they want to achieve, what’s their gain? They want to save money. They want a fully automated farm where they can maximize crop harvesting through big data. The job to be done is to choose the right machine from a field of me-too-machines. How do they discern the right machine at that time? They have to make a choice, not based on general quality, but based on the quality they can achieve on their farm with this machine. With this information, as a farming machinery business, you have an idea of the innovation you have to implement: create machines that are adaptable in size, depending on the customer and the crop they want to harvest. Implement modular innovation on the machinery so that the same tractor or combine harvester can expand or change depending on the size of the farm and the crop. Create machinery that the farmers can test on their farm. These pains, gains, and jobs to be done occur at every step of the customer journey. From their initial contact with your company, and that could be by email, telephone or your website, right down to your after sales, follow up and complaints handling. Create cross-functional teams and get them to go out, find the people on your customer map, and do short interviews with them, either face to face, through telephone or through video, to check if your presumptions about their needs are true. Maybe they’re not. Make one big wall in your innovation and agility war room about real people. Put their photographs up there. 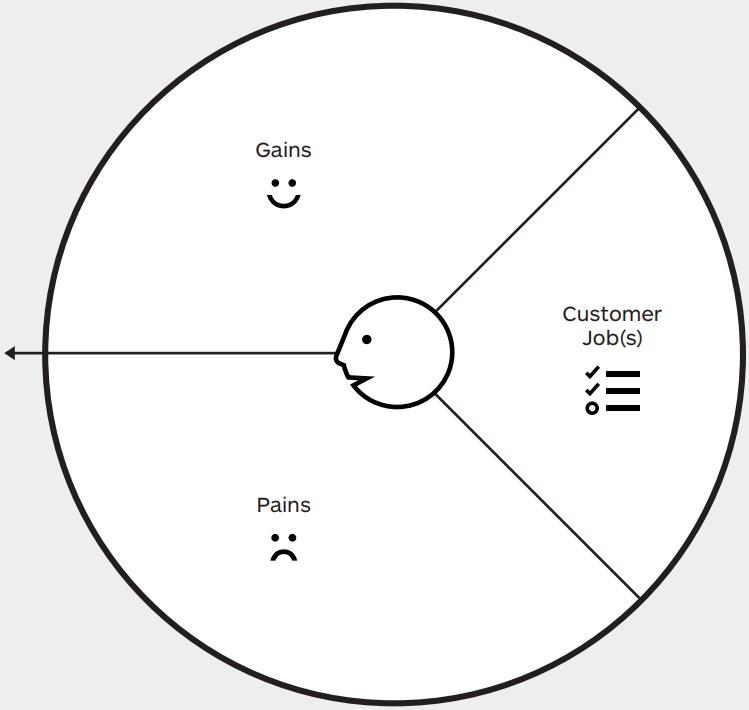 This extrapolation helps you refine your customer map with real people, and actual information. This is not guessing. You are documenting real life stories, anecdotes, and experiences. The next step is to take all these stories and categorize the types of customers you actually have. Now design the customer journey for this type of real customer as they have contact with your company. With that person in mind you draw the customer journey that they have when they get in touch with your product or your process or your service by hand on your war room wall. There are no rules to drawing the customer map and customer journey. You work it out together, as a team. Now you can write down, from the real information you have collated, their pains, gains, and jobs to be done at each stage of the journey. 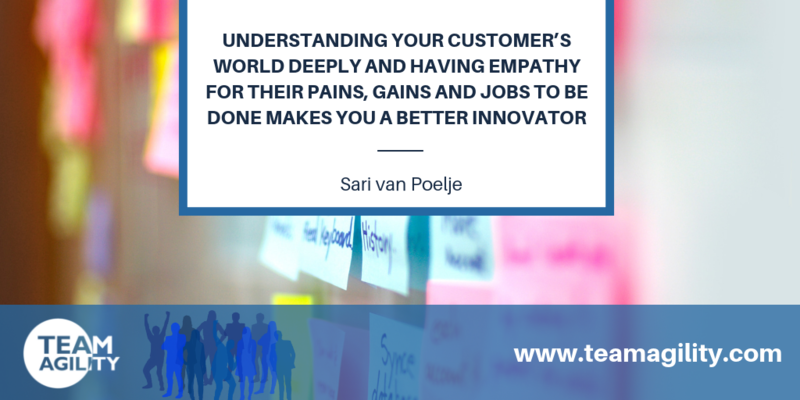 Understanding your customer’s world deeply and having empathy for their pains, gains and jobs to be done makes you a better innovator.